He freely willed to take flesh from the Virgin who did not know man. He saved mankind from the ancient curse of death. and great mercy to the world. and then arose from the dead on the third day. one person in two perfect natures with two perfect wills. Therefore, we profess that You are one God with the Father and the Holy Spirit. We sing a hymn of praise to the Fathers, and we adore You. concerning the doctrines of Christ. that Christ is one divine person in two natures. one with the Father and the Holy Spirit. O holy Fathers, we honour you and sing to you a hymn of praise. the act and will of the Son of God. those of the Son of Man. the one is divine and the other is human. and glorify Christ who glorified them. that the eternal Trinity is one God and one Lord. not divided nor shared but existing in the simplicity of God’s being. had no beginning and will never have and end. for they taught all people the true doctrine of God. 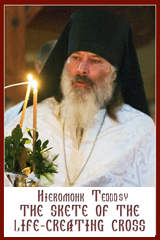 refuting Arius and defending the orthodox faith. to have mercy on our souls. and was seen in the flesh He received from her. He is the One and only God having two natures but not two persons. that Christ our God is perfect God and perfect Man. intercede with Him that He may have mercy on our souls. so that You might ascend the cross. O immortal Life, You came to die. and You are the resurrection of the fallen. Therefore, O Saviour of all, we glorify You. The Lord reigns, He is clothed in majesty. * Robed is the Lord, and girt about with strength. Who arose from the dead. and during His passion He separated the one from the other. while His holy body lay uncorrupted in the grave. For He has made the world firm. * which shall not be moved. O Christ, we glorify Your resurrection with psalms and hymns. and as God You granted us eternal life and great mercy. Holiness befits Your house, O Lord, * for length of days. You are above all understanding. You freed us from the sufferings of Hades. and with Your mighty arm You also raised up Adam. You granted us remission of sins and eternal life. you are the faithful keepers of the Apostles’ traditions. you refuted the blasphemy of Arius. you put Macedonius, Severus and other heretics to shame. and keeping our lives blameless in God’s sight. O most pure Virgin, hear the petitions of your servants. for you are the only firm and constant support on whom we rely. to be overwhelmed by our cares. the joy, the refuge, and the salvation of our souls. You came down from on high, O Merciful One,* and accepted three days of burial* to free us from our sufferings. * O Lord, our life and our resurrection,* glory be to You. Christ our God, You are glorified above all,* You established our fathers as beacons on earth* and through them guided all of us to the true faith. ** Glory to You, most compassionate Lord. O gracious Lord, for the sake of mankind You were born of a virgin: * through Your death on the Cross You conquered Death; * and through Your resurrection You revealed Yourself as God. * O merciful Lord, do not disdain those whom You have created with Your own hands, * but show forth Your love for mankind. * Accept the intercession which the Mother, who bore You, makes in our behalf. ** O Saviour, save Your despairing people. Troparion, Tone 8: You came down from on high, O Merciful One,* and accepted three days of burial* to free us from our sufferings. * O Lord, our life and our resurrection,* glory be to You. 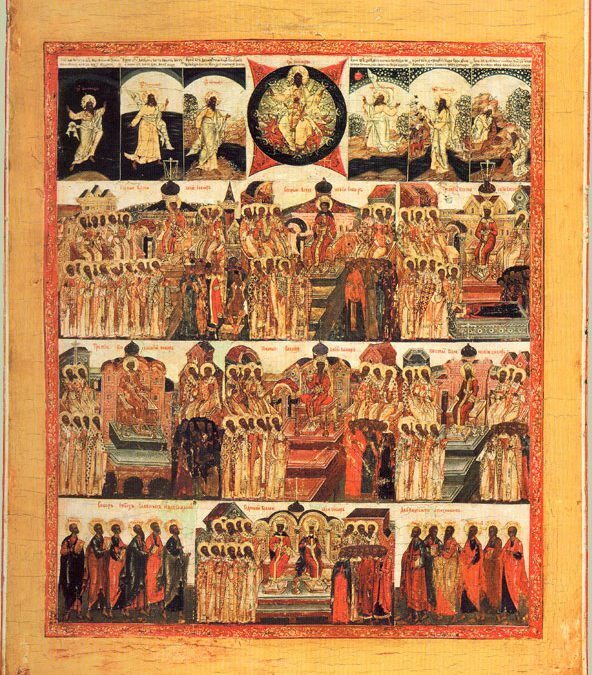 Troparion, Tone 8: Christ our God, You are glorified above all,* You established our fathers as beacons on earth* and through them guided all of us to the true faith. * Glory to You, most compassionate Lord. Kontakion, Tone 6: The Son who ineffably shone from the Father* was born two-fold of nature from a woman. * Beholding Him, we do not reject the image of His form;* but depicting it, we revere it faithfully. 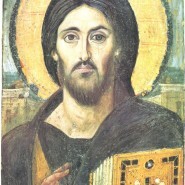 * Therefore, the Church, holing the true faith,* kisses the icon of Christ’s becoming man. Theotokion, Tone 6: Undaunted patroness of Christians,* O steadfast intermediary with the Creator,* turn not away from the suppliant voices of sinners,* but in your kindness come to help us who cry out to you in faith. * Be quick to intercede, make haste to plead,* for you are ever the patroness of those who honour you, O Mother of God. Blessed are You, Lord God of our fathers,* and praised and glorified is Your Name forever. verse: The God of gods, the Lord, spoke and summoned the earth from the rising of the sun to its setting.